Religion • Thousands are expected to turn out for the Buddhist leader's visit to SLC. 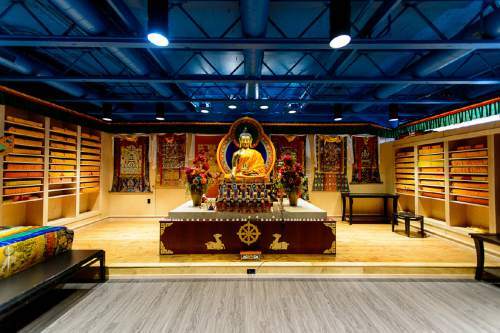 Trent Nelson | The Salt Lake Tribune The prayer room at the newly opened Tibetan Cultural Center in Salt Lake City features a new 5-foot tall Buddha statue from Nepal and the original throne His Holiness sat in during his last Salt Lake City visit in 2001. The main reason for His Holiness the Dalai Lama's Utah visit next week is to bless and consecrate the center. Trent Nelson | The Salt Lake Tribune The prayer room at the newly opened Tibetan Cultural Center in Salt Lake City, Friday June 17, 2016. The main reason for His Holiness the Dalai Lama's Utah visit next week is to bless and consecrate the center. The room features a new 5-foot tall Buddha statue from Nepal and the original throne His Holiness sat in during his last Salt Lake City visit in 2001. Trent Nelson | The Salt Lake Tribune The prayer room at the newly opened Tibetan Cultural Center in Salt Lake City, Friday June 17, 2016. The main reason for His Holiness the Dalai Lama's Utah visit next week is to bless and consecrate the center. The room features a new 5-foot tall Buddha statue from Nepal and the original throne His Holiness sat in during his last Salt Lake City visit in 2001. Trent Nelson | The Salt Lake Tribune A large hall at the newly opened Tibetan Cultural Center in Salt Lake City, Friday June 17, 2016. The main reason for His Holiness the Dalai Lama's Utah visit next week is to bless and consecrate the center. 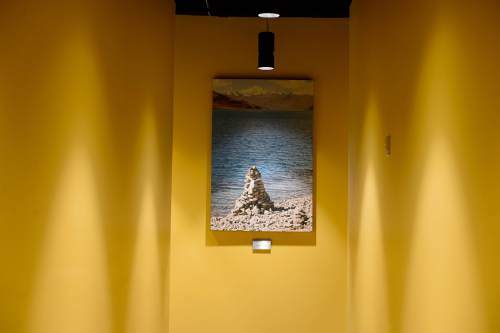 Trent Nelson | The Salt Lake Tribune A hallway and photograph at the newly opened Tibetan Cultural Center in Salt Lake City, Friday June 17, 2016. The main reason for His Holiness the Dalai Lama's Utah visit next week is to bless and consecrate the center. 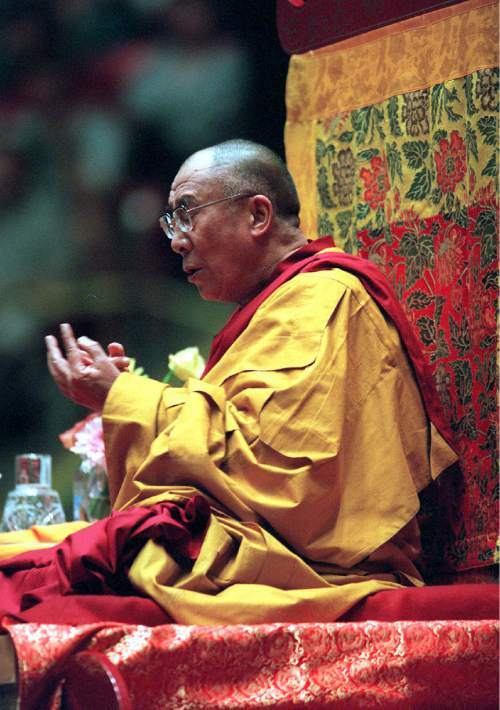 The Dalai Lama talks about the Six Perfections of Buddhism at the Huntsman Center during his 2001 visit. 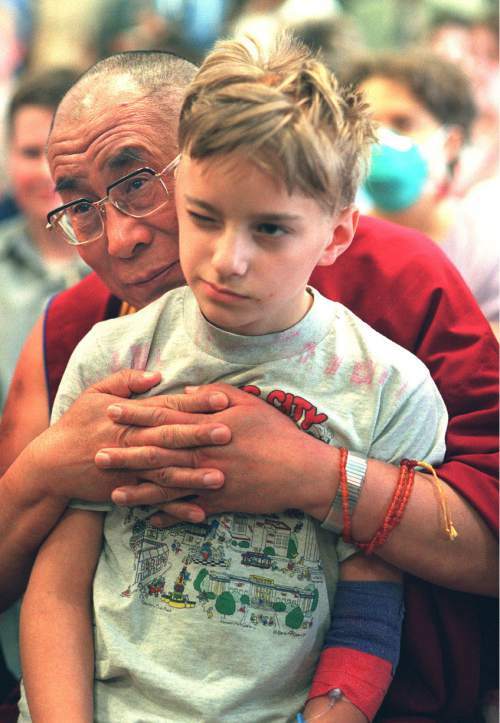 Photo by RIck Egan Rick Egan | Tribune file photo The Dalai Lama hugs 13-year-old Richard Gordier, from Ogden, while visiting Primary Children's Hospital on Thursday, May 10, 2001. 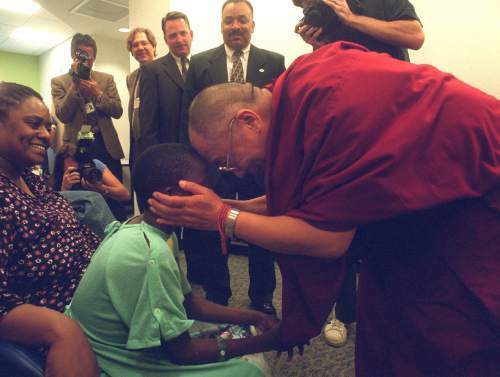 The Dalai Lama talks to Brandon Murphy at Primary Children's Hospital during his 2001 visit. 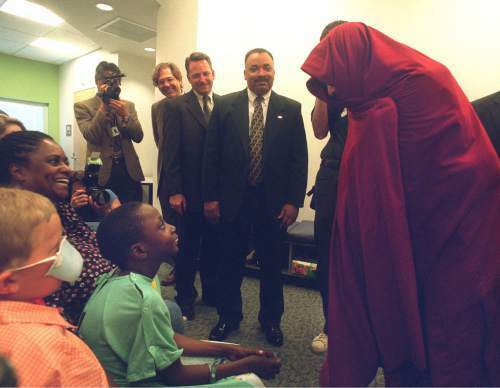 Photo by Rick Egan The Dalai Lama shows Brandon Murphy what he can do with his robe when it gets cold while visting the kids at Primary Children's Hospital in 2001. Photo by Rick Egan The Dalai Lama chats with reporters at the Utah Governor's Mansion during his 2001 visit. Gov. Gary Herbert plans to meet with the Buddhist monk during the spiritual leader's 2016 visit. 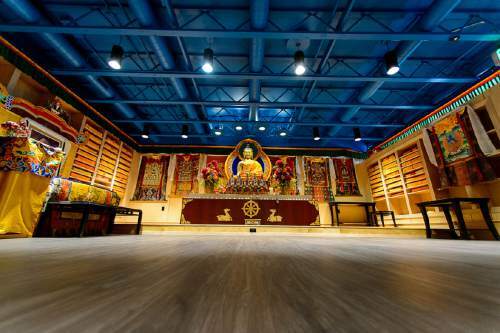 Photo by Rick Egan Trent Nelson | The Salt Lake Tribune The prayer room at the newly opened Tibetan Cultural Center in Salt Lake City, Friday June 17, 2016. The main reason for His Holiness the Dalai Lama's Utah visit next week is to bless and consecrate the center. 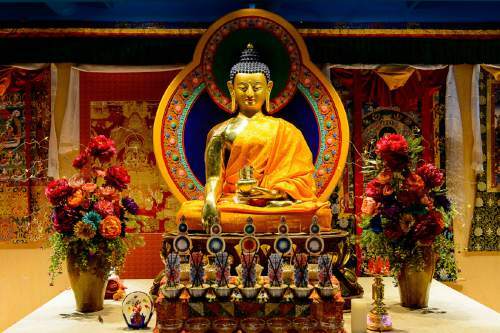 The room features a new 5-foot tall Buddha statue from Nepal and the original throne His Holiness sat in during his last Salt Lake City visit in 2001. 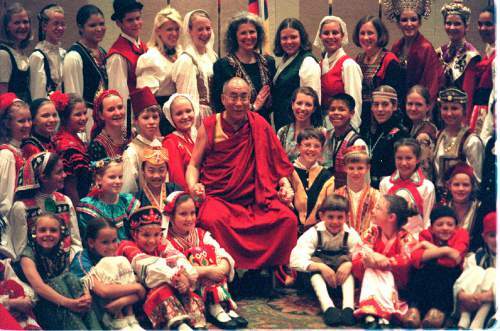 The Dalai Lama visits with the International Children's Choir at the Marrioltt Hotel during his visit to Utah in 2001. 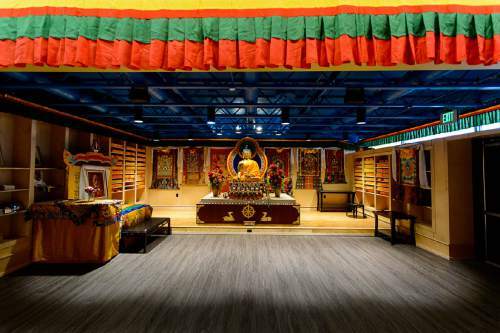 Photo by Rick Egan Trent Nelson | The Salt Lake Tribune The prayer room at the newly opened Tibetan Cultural Center in Salt Lake City, Friday June 17, 2016. The main reason for His Holiness the Dalai Lama's Utah visit next week is to bless and consecrate the center. The room features a new 5-foot tall Buddha statue from Nepal and the original throne His Holiness sat in during his last Salt Lake City visit in 2001. As you might expect for someone considered a sacred being, His Holiness the 14th Dalai Lama is many different things to many different people. The 80-year-old Buddhist monk and global symbol arrives in Salt Lake City on Tuesday, his first visit since 2001  thrilling spiritual followers and fellow Tibetans, those of other faiths, admirers and people simply curious about the exiled leader&apos;s message. Nearly 15,000 people are expected to fill the University of Utah&apos;s Huntsman Center for his afternoon speech on compassion and universal responsibility. 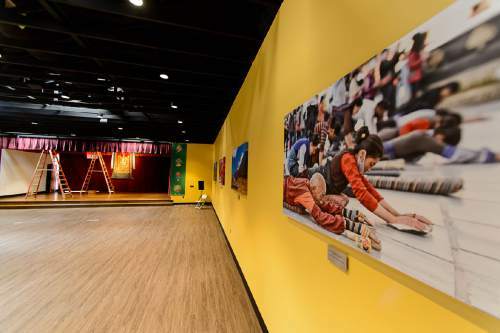 The 1989 Nobel Peace Prize winner also plans to meet with the Tibetan community at its newly opened cultural center in South Salt Lake. To Pema Chagzoetsang, among the handful of Tibetans who first resettled in Utah, his tour of the new 10,000-square-foot renovated warehouse will crown more than 25 years of struggle, fundraising and plain hard work. "We are just ecstatic, so grateful," Chagzoetsang said as Utah Tibetan Association members made final preparations. Judging from ticket demand for Tuesday&apos;s sold-out event, the Dalai Lama&apos;s persona and worldwide advocacy for compassion and dialogue have brought him broad appeal among non-Buddhists in Utah. The Rev. Curtis Price at Salt Lake City&apos;s First Baptist Church called him an "incredible figure." "Anyone who speaks that kind of compassion and peace into the world is an ally of Christ and a friend of my church," Price said. 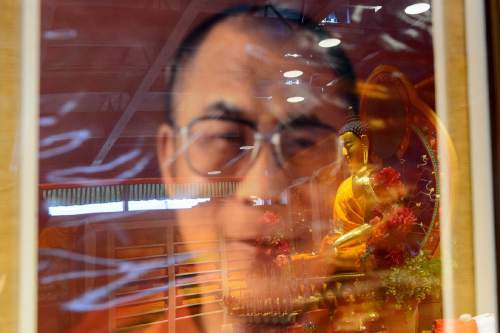 The state&apos;s thousands of Buddhists in many traditions see the Dalai Lama&apos;s spiritual teachings, candidness and influence as a precious balm in today&apos;s often-violent world. "Our automatic response a lot of times is anger, because our suffering is overflowing," said Christopher "Myoshin" Ross-Leibow with the Salt Lake Buddhist Fellowship, whose Jodo Shu tradition is rooted in Japan. "To be able to see somebody who responds automatically from the space of compassion is a great example that we need right now." 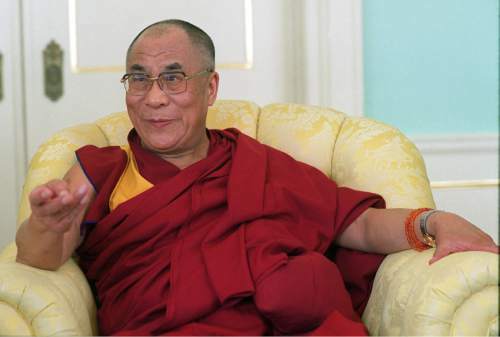 Many recount being deeply impressed by the Dalai Lama&apos;s gentle demeanor. Buddhist educator and licensed counselor Rich Glade of Salt Lake City recalled a chance one-on-one moment when he came 15 years ago. "It was probably the most extraordinary experience that I&apos;ve had," said Glade, describing the monk&apos;s calm humility and clear presence of mind. "I felt profoundly blessed and profoundly unworthy." Those same down-to-earth qualities led the Rev. Jerry Hirano with the downtown Salt Lake Buddhist Temple, also tied to Japan, to call him "a great exemplar of living Buddhism." To practitioners in the Dalai Lama&apos;s own ancient Vajrayana lineage, this man born in a cowshed in northwestern Tibet is the reincarnation of Chenrezig, a kind of coalescence of pure and infinite compassion. Having long ago attained ultimate enlightenment, the belief goes, he could escape the cycle of birth and death but has instead chosen to be reborn repeatedly to help ease suffering in the world. "I respect him more than anyone on the planet," said Cynthia Shumway with Katog Jana Ling, a Vajrayana group based in Millcreek. "He consistently offers something so authentic, usable and real." Along with senior devotees from across the West, Shumway said her group&apos;s direct spiritual mentor, a Tibetan master named Khentrul Lodro Thaye Rinpoche, will travel to Salt Lake City at the same time, partly to help them absorb the Dalai Lama&apos;s teachings. "We&apos;re very excited," she said. At Urgyen Samten Ling, a Vajrayana Buddhist temple in a historic former Mormon meetinghouse on Salt Lake City&apos;s 300 West, practitioners are preparing for an around-the-clock prayer festival a week after the Dalai Lama departs. They will recite more than a million short prayers over four days in devotion to him as the embodiment of Chenrezig. The temple&apos;s resident teacher calls the Dalai Lama a "universal icon of peace, harmony, happiness and kindness" and "a modern-day superhero." "He doesn&apos;t come with some badge or a spear or a hammer," said Lama Thupten Dorje Gyaltsen Rinpoche, also known as Jerry Gardner. "What greater power is there in the universe other than loving kindness and compassion?" Chenrezig has counterparts in other Buddhist traditions, with names such as Avalokiteshvara, Jiso, Kanzeon and Kuan-yin  giving all Buddhists a connection to that side of the Dalai Lama. "He&apos;s beyond sectarianism to that degree," said Michael Zimmerman, a former Utah Supreme Court justice who, with his wife, Diane Hamilton, now heads Two Arrows Zen, a Buddhist center at Artspace in downtown Salt Lake City. The Tibetan leader is also widely praised for his ability to seek common ground with other global faiths as well as scientists, political leaders and even China, which many Tibetans regard as having invaded and occupied their Himalayan nation in the 1950s. And by speaking out regularly on ecology and a need for compassionate engagement, the Dalai Lama has spurred a host of U.S. peace and environmental advocates as well. Many of them will be on hand Tuesday. Said Vaughn Lovejoy, climate activist and retired project coordinator of the nonprofit tree-planting group TreeUtah: "I&apos;ve just found him an absolute inspiration to watch over the years." • All sentient beings are endowed with enlightened minds but that innate quality is often obscured by self-centered emotions such as anger, ignorance and desire. • Everything about existence is impermanent and all phenomena are interdependent, arising from causes and conditions. • Suffering, also referred to as disappointment, is a central and pervasive facet of the cycle of life, born of craving and aversion. • Suffering can be overcome through devotion to leading a moral life, being mindful of one&apos;s thoughts and actions, and cultivating wisdom and understanding. • An enlightened mind has naturally arising qualities such as compassion, loving kindness, joy and equanimity.